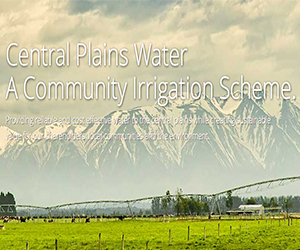 The Central Plains irrigation scheme is launching into its second phase. Primary Industries Minister Nathan Guy has welcomed the construction on Stage 2 of Central Plains Water (CPW), on the promise that it will deliver economic benefits of up to $374 million. But some argue that the clean-up costs associated with nitrogen overloading outweigh the economic gain. Phase 2 of the irrigation project is expected to deliver a consistent water supply to an additional 20,000 hectares in order to support arable, sheep and beef finishing, dairy farming and horticulture. Its proponents argue that the scheme’s key environmental benefit is that it draws on alpine-sourced water rather than ground water, thereby reducing pressure on the aquifers needed to recharge lowland streams. “Replacing groundwater with river and stored alpine river water has the potential to improve water flows into Lake Ellesmere – Te Waihora, helping the long-term process of improving its water quality”, said Minster Guy. Recent, rapid land-use change and intensified farming has left parts of the Selwyn-Waihora catchment hypertrophic, with the once pristine Te Waihora now ranking among New Zealand’s most polluted lakes. A package of measures to support the rehabilitation of the Te Waihora will require at least $200m in funding over the next 20 years. This is additional to the estimated $774.6m worth of community efforts to restore the lake, over a 10-year period, according to a report by RNZ. Recommendations set out in a report produced by Canterbury Regional Council in 2013 found that a 50% decrease in the current load of both nitrogen and phosphorus is needed to improve water quality in Te Waihora. The expanded irrigation, however, is estimated to increase the current nitrogen load in the Selwyn-Waihora catchment from 3200 tonnes a year, to 5600 tonnes. To address this, two funds led by Irrigation New Zealand and Federated Farmers, with a combined value of just under NZ$600,000, have been established with the objective of reducing nutrient loading in waterways. In order to qualify for scheme water farms will need to comply with stringent standards, and must prepare a plan with a nutrient budget. But these measures are only expected to diminish nitrogen loading to 4800 tonnes per year.